Fundraising Event for Dog Guides | Deafened But Not Silent. Another quick blog posting is needed. 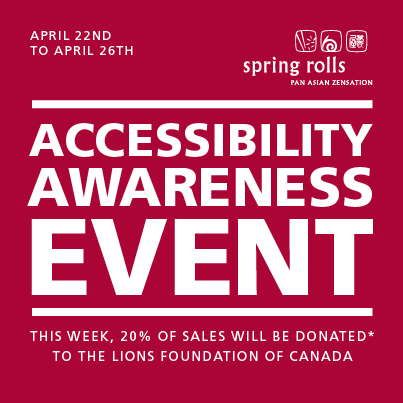 Spring Rolls will be organizing a event called Accessibility Awareness Week. They will be donating 20% of their proceeds to the Lions Foundation of Canada. As some of you may know, Lions Foundation trains various dogs to assist people with visual or hearing impairments, physical challenges etc. Click here for more information about Lions Foundation of Canada Dog Guides Program. Again, I wish to thank the management of Spring Rolls for their generosity and their assistance in bringing greater awareness to this issue. This entry was posted in Hearing Loss and FM by Peter Stelmacovich. Bookmark the permalink. I think Spring Roles did a risk assessment; I’m loving it. Great work Peter! Great result – not just awareness via the initial PR but wider local awareness driven by the resto itself! Kudos to you Peter for taking a stand. I read about you in the Star and felt compelled to write to Spring Rolls as well. Thanks so much for your support. As you can see, we did have a positive outcome in my case. I am thankful that this restaurant chain apologised, made policy changes, and raised money for Lion’s Foundation. I am grateful to Spring Rolls for doing the right thing. I hope that others in the service industry learn from this and comply with legislation.